I follow several social justice leaders and activists on Twitter. 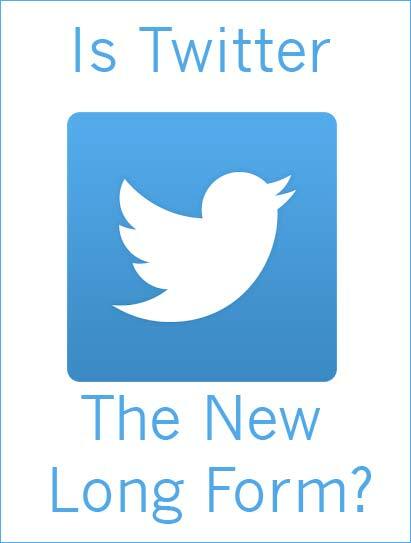 I have noticed that they use Twitter in a way that is different from in the past. In the past, tweets were singular events – a comment, a link, a share of some sort. A lot of people, myself included, still use Twitter that way. The activists using Twitter now use it as a long-form platform. They pick a topic and tweet about it at length. Dozens of tweets in a day. If you stumble onto Twitter in the middle of one of these tweeters making a point, you must to go back, find your way to the beginning, find your way through the thoughts and watch to keep up. It often requires looking at whole conversations, checking for replies and questions, and then going back to the main thread. Since most people are not watching Twitter 24/7, this approach requires some work for the people who may care about what is being tweeted, but it offers some advantages. For the readers, a blog post would be easier to follow. All those thoughts could be put in one post, in the right order, and sent out. But easy isn’t the point. Advocacy is the point. Change is the point. Being heard right now is the point. Interaction is the point. Twitter offers immediacy. There’s immediate feedback, immediate retweeting, immediate sharing of voices and information. Twitter is engaging. Many people can think and talk about an event or an idea in real time. Twitter is forgiving of speed. Typos, awkward phrases, abbreviated thoughts are overlooked in the name of speed. There’s no need for polish. Who would have imagined, when Twitter began, that it would become the long form discourse platform of choice for social change? Thanks to @redcrew, who just alerted me to Introducing the Tweetstorm. This article proposes a solution to the problems I outlined above for anyone trying to either write or follow a series of tweets on a particular topic. The developer, Daniel Rakhamimov, suggests a way to connect a series of tweets automatically through what he calls a Tweetstorm. His idea has many advantages to both readers and writers when Twitter is used as a longform medium. It’s a must read article and a great idea! You’re going to a great conference. You’re going to do lots of networking. The stack of business cards you accumulate will be enormous. Here are a couple of tips to help you keep all those names, faces, Twitter handles, and URLs straight. Twitter lists are easy to create. They provide a way to read Twitter feeds from people according to groupings or interests. You don’t even have to be following them. You might have a list of food bloggers or tech bloggers or some other category of Twitter users. When you view the list you see tweets only from the specific people you added to the list. When someone hands you a business card at a conference, you can quickly add their Twitter handle to a list. That will help you keep names and faces organized. 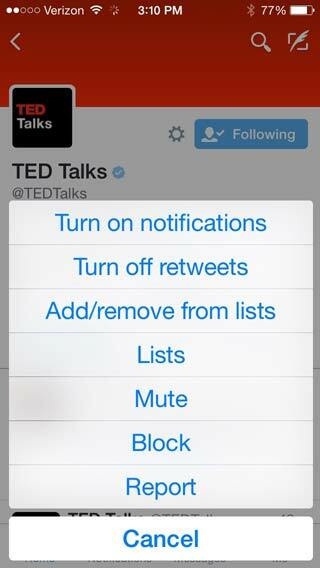 You can create a list and add to it from a desktop browser or from a mobile Twitter app. Let’s step through creating a list with a desktop browser first. Sign in to your Twitter account in a browser. Here’s mine as an example. In the menu bar opposite your profile photo, click the Lists link. When the Lists page opens, you’ll see any lists you subscribe to (you can subscribe to any public list, including your own), any lists you’ve been added to as a member, and the invitation to create a new list. Once you have lists created, this is where you would find them in your desktop browser. Click Create new list, give the list a name, and you can begin adding Twitter accounts to it. When you create a new list, you can make it public or keep it private. If it’s a public list, it has a URL and anyone who is interested can subscribe to it. 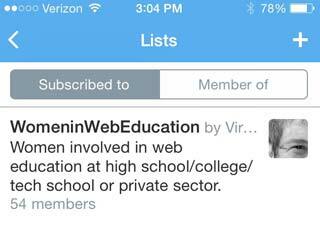 For example, here’s one of my public lists: womeninwebeducation. To add someone to a list, find their user profile. You can search for their name, or just click on their name if you see it on Twitter. When their Twitter profile opens, click the gear icon by the Follow button to see user options. Select Add or remove from lists. Your lists open up and you check or select the list you want to put the user in. Touch the Me icon at the bottom of the screen to see your own profile. Touch the gear icon next to your profile image to see Lists on the menu. Touch Lists. At the top of the Lists page, you see a plus (+) sign. Touch it to create a new list. Give the list a name and decide if it’s public or private. Once you have lists built, this is where you would go in the mobile app to read the lists you’ve subscribed to. This is also where you can see lists you’ve been added to by someone else. Next, add Twitter accounts to your list. 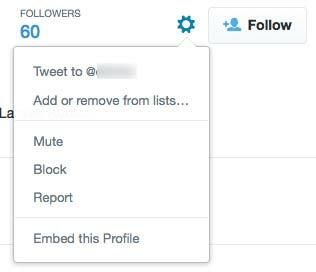 When you’re viewing the Twitter profile of the account you want to add to a list, touch the gear icon to see Add/remove from lists. Press Add/remove from lists and select the list you want to use. In addition to viewing lists from a browser or the mobile app, tools such as TweetDeck have options that allow you to add columns for lists to your display. Feedly is an RSS feed reader. There are many such tools, and you may already be using one to keep track of blogs you want to follow. 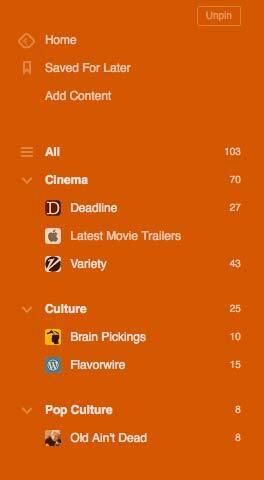 The reason I mention Feedly in particular is that it offers a way to organize blog feeds into categories. You create categories yourself, or you can use Feedly’s suggestions for categories such as Food, Fashion, Books, or whatever. Feedly has both a mobile and a desktop version, which makes it easy for you to take those conference contacts you made and quickly add blog URLs to the proper categories. In addition, there’s a pro version of Feedly ($5 a month or $45 for a whole year) that connects to Evernote where you can write notes or save snippets from blog posts. You can login to Feedly with your Google ID or your Facebook ID. I logged in and customized my view a bit, which explains the orange. Hope you like orange as much as I do. At the Home page, there’s a menu on the left. It shows you the 3 categories I have so far: Cinema, Culture and Pop Culture. So far I only have a few blogs in each category. When the home page opens, all the unread feeds from everything appears, but I can click on any one of the categories or blogs and see only that. 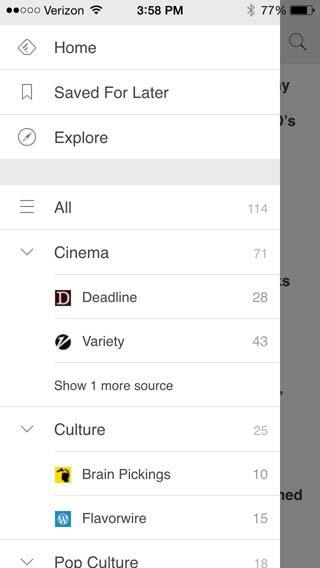 Feedly has many categories you can browse, or you can make your own. Feedly calls these Collections. To quickly add a specific blog, find the search box on the upper right. Type in the URL of the blog you want to add. I typed www.theculturemom.com. The search brought up the feed from The Culture Mom. 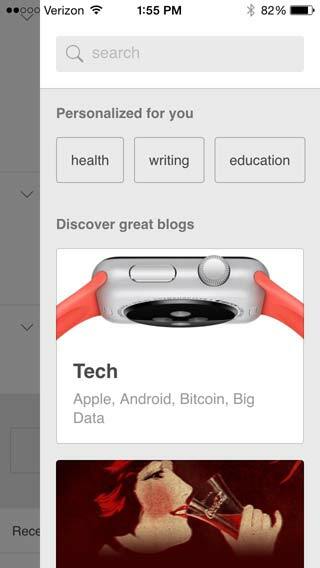 Next to the name of the blog at the top you see a button with +Feedly. I click that to add this blog to one of my collections. I select the collection I want. Or I can add a new category. On your mobile device, the Feedly app takes some practice to get used to the way it swipes, but you’ll get the hang of it quickly. It opens with all your unread posts. A menu at the upper left reveals your specific collections and blogs, which you see opened above. At the upper right, there’s a magnifying glass. Touch that to quickly add a blog. The search box opens, where the URL of the blog you want, e.g. 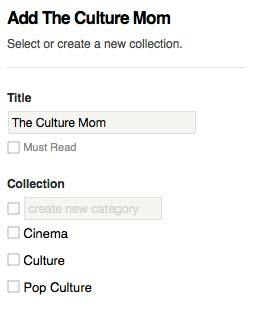 theculturemom.com, can be added. 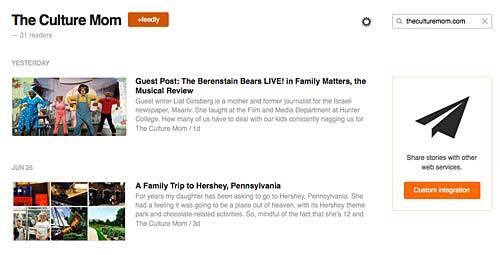 Feedly also suggests blogs it thinks you will like. When the search results appear, you see a plus (+) sign at the top near the name of the blog feed. Touch that plus sign and add the blog to the appropriate collection. It only takes a few seconds to add the information from a business card to a Twitter list or Feedly collection. If you do it while the person who gave you the card is still fresh in your mind, it will help you remember who you’ve talked to, what their interests are, what their blog is about, and it will give you a way to keep an eye on their tweets. Then you can concentrate on having a great conversation with the next person you meet. About a year ago I started a new pop culture/entertainment blog called Old Ain’t Dead. I started a new Twitter account for it as well @OldAintDead. In the service of my new topic, I wanted to follow the tweets of many people and sources who write about entertainment and the stars making the pop culture news. I also wanted to get people to follow my new Twitter account. A much harder proposition. 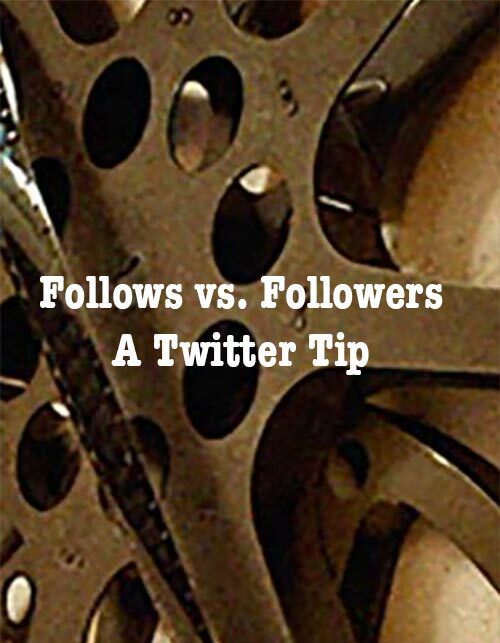 It’s a slower process to get followers than it is to find people to follow. I didn’t want the numbers to be out of proportion when potential new followers looked at my twitter profile. 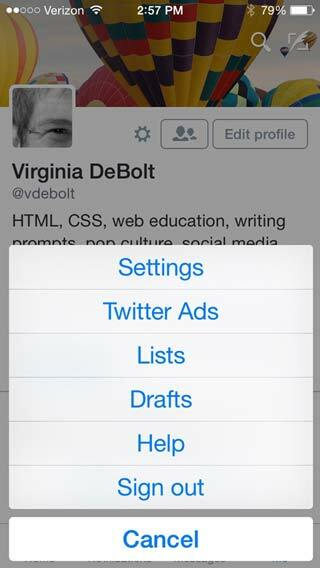 My regular Twitter account, where I tweet about web design topics, is @vdebolt. There I have more followers than people I follow. Having more followers than accounts I follow looks okay. It’s great to have lots of followers in proportion to the number you are following. Makes you look interesting. But what about the @OldAintDead Twitter account. If I were following 2000 entertainment accounts and only 412 people were following me, it would look as if over 1500 people decided not to follow me back. Someone seeing my profile would think I’m not worth following. The proportion of following to followers is fairly equal because I put public figures in a list. My numbers are about equal now. That’s okay with me. So how did I manage to keep track of people I want to follow without actually following them? I used a list. I took all those people and organizations I wanted to read like @Variety and @ShondaRhimes – people who would never follow me back – and I put them in a list. I called the list #mediawelike. I put actors, shows, media sites, networks, and those kinds of accounts in the list. For my @OldAintDead Twitter feed, I follow real people who follow back, people who sometimes read my blog and people who are willing to engage in a conversation about something on Twitter. I use Tweetdeck for watching Twitter in a browser. On my phone, I use Hootsuite. (Hootsuite doesn’t have an option for viewing lists.) Here’s what I see in my Old Ain’t Dead Twitter feed in Tweetdeck. You see my Home feed, which is where I see the accounts I follow. I also keep open a notifications column. You also see the column for tweets coming in to the #mediawelike list. By using the list, I can keep the number of people I follow in a reasonable ratio compared to the number who follow me. Creating a list is simple. In a browser, go to the Lists tab on your profile page. The create a new list option can be found there. Makin’ a list and checkin’ it twice. Gonna find out who’s naughty and nice. No, wait. Wrong song. Just go make a list. It made news this week when Twitter asked Instagram users to post images directly to Twitter instead of posting a link to the photo on Instagram. When an image is posted on Instagram, the user can choose to send a link to the image to Twitter. An image from Instagram will show up on Facebook when shared there, but Facebook owns Instagram. Yesterday I heard an interesting talk from Meagan Rhodes (@MeaganNRhodes) about using social media. (She’s worth following on Twitter if you’re interested in social media for your business.) She talked about how millennials are all on Instagram. She’s a young woman herself (at least when compared with me) and much more in touch with what millennials are doing with social media. I personally don’t mind clicking through from Twitter to see a photo on Instagram, although Meagan said most younger people won’t click. But Twitter wants the original image to be put on Twitter and for the link to Instagram to go away. There are more active users on Instagram now than there are on Twitter. That’s a big change. There are some reasons for this. Instagram is all visual. The world is rapidly becoming all visual. Instagram allows more than 140 characters. Instagram allows a number of hastags in each post. And additional hashtags can be added later in a comment on your own photo. Comments on Instagram photos are directly under the photo and don’t require searching back through different threads on Twitter. That means any hashtags associated with photo are right there on the page with the photo. The Instagram accounts of people who visit and comment on your photo are right there and easy to Follow. When you list some of the reasons for Instagram’s heavy use by millennials, it becomes clear why Instagram is taking the lead over Twitter and winning the lottery for eyeballs. It would be good for Twitter if users took their advice and actually posted their photos directly on Twitter. But how would it benefit anyone’s brand, traffic, or image sharing from the Instagram side of things? It would not. A while back I wrote about adding Instagram photos to your own blog. Everything I said in that post still applies for two reasons. It your blog. It’s not a link to a photo as with Twitter. An Honest Look at Online Education is helpful and comprehensive. A collection of links to slide decks from the HTML5 Developer Conference. Assessing My Personal Gender Bias on Twitter is a terrific post by Terence Eden. Are you ready to put some arithmetic to your gender bias? Using the HTML5 Section Element is very helpful. Interview Questions and Exercises for CSS. This post is about how to interview someone you want to hire as a CSS person, but the exercises would be terrific in a classroom. Take a look. Storify’s embeddable stories now listed under Twitter’s related headlines section. This is really a useful connection. From a research point of view this will save so much time. From a publishers point of view, it will bring in more traffic.